Members of the Lawrence Symphony Orchestra perform in the Lawrence Memorial Chapel. 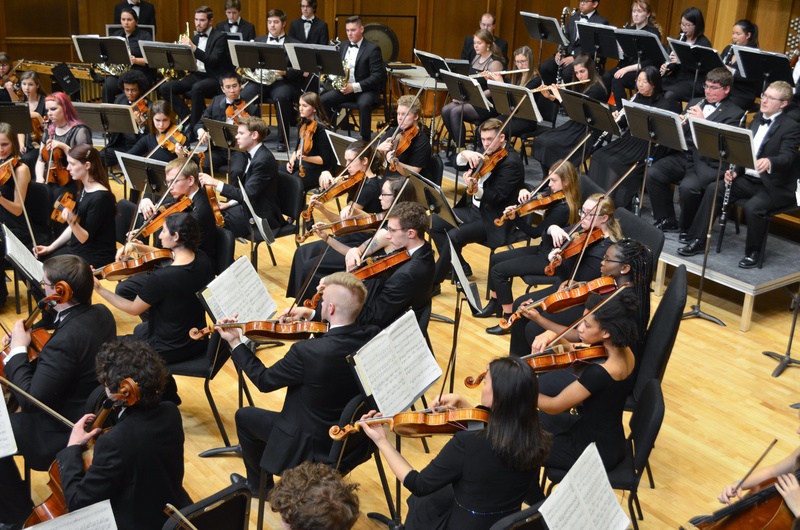 On the evening of Friday, Feb. 1, the Lawrence University Symphony Orchestra (LSO) performed a concert in Memorial Chapel. Their program, titled “Eroica,” featured the Beethoven symphony of the same name as well as George Gershwin’s “Rhapsody in Blue” and Michael Torke’s “Javelin.” Gershwin’s iconic piano part was performed by senior Neil Krzeski who was a cowinner of the 2019 LSO Concerto Competition. As the LSO played their tuning note, there were only a handful of open seats in the Chapel balcony. After nearly three months without an LSO concert, the Lawrence community was clearly eager for the orchestra to return to the stage. Before they began, conductor Mark Dupere greeted the audience. He offered a very warm welcome to everybody who braved the glacial weather that had approached 50 below with wind chill only two days prior. Dupere went on to explain that owing to these frigid temperatures, the LSO had been forced to cancel their crucial concert week rehearsals. Thankfully, after an emergency evening rehearsal, the LSO was still able to put the finishing touches on their program. Dupere commended the musicians for their adaptability and the audience applauded in appreciation of their hard work and commitment to their art. The concert began with “Javelin.” Program notes explained that the Atlanta Committee commissioned Wisconsin native Michael Torke for the Olympics and the piece was played for the opening ceremonies of the 1996 Olympics in Atlanta. Just like the iconic Olympic theme song, “Javelin” captures the spirit of friendly competition. Torke stated that to create this effect, he took some cues from famous cinematic composer John Williams. Williams’ score for “Star Wars” is instantly recognizable and evokes the drama of a gargantuan galactic struggle between the forces of good and evil. Torke’s composition employs similar strategies to evoke the valor of Olympic athletes and all the excitement of the games. Thematic music sets the mood for what’s to come, and for this concert, “Javelin” was a perfect prelude. Next, Krzeski took the stage for “Rhapsody in Blue.” I was delighted to see a banjo player appear as well to complete the orchestration for this quintessentially American piece of music. Krzeski was already impressive as he played through the opening themes with the orchestra, but his virtuosity became even more apparent when the orchestra dropped out for a cadenza section. Krzeski’s fingers fluttered like a hummingbird’s wings as his hands hopped furiously from one end of the piano to the other. The excitement only grew when the orchestra joined back in for the finale section, recapitulating the “Rhapsody’s” themes with even more exuberance while Krzeski’s part only continued to intensify. After the final note, Krzeski received a resounding standing ovation. In a way, the trajectory of the piece parallels the archetypal “Hero’s Journey.” The first movement depicts the courage and boldness of the hero at the outset of their journey along with the first intimations of the struggle that’s yet to come. The hero descends into the abyss in the second movement and after a series of musical trials and tribulations, they emerge triumphant in the final movement. “Eroica” featured a smaller orchestra (unfortunately, no banjo) and lasted 45 minutes. The musicians were clearly focused intently on communicating the story of the now-anonymous hero. They adjusted their sound from movement to movement and section to section as they followed the hero’s descent and eventual re-ascent—a pattern that remains universally meaningful while being endlessly mutable. I even noticed the posture and facial expression of some musicians change accordingly with the hero’s “situation.” Throughout this lengthy journey, the LSO continually created musical—and narrative—interest and kept me riveted.